Has Digital Transformation always been about sifting data, strategy, and culture? Last week, David Powell shared his concerns about my blog “Need new tactics”. He wondered whether the current hype is all that different. He shared with me his personal experience with digital transformation. Walk along through history and judge for yourself, has digital transformation always been just about sifting data? In my blog, I wrote: “Don’t confuse digital transformation with the move from analogue to digital signal processing that happened decades ago. For most service firms, this meant replacing old equipment with a modern, smaller digital version, such as for example rotary phones. No fundamental shift in strategy or culture was needed to accomplish that transformation.”. I asked for permission to share the following story. The headings are added for clarity. “I fully appreciate your comment is aimed at folk like me that consider digital transformation started with the advent of digital signal processing, however that was the start of being able to sift easily through data, as I explain below, there was a huge shift in strategy and culture. What you are referring to in your blog is just sifting through data, data is just stuff being stored, and therefore just stuff to sift through. Since the beginning of the human race, we have been sifting through stuff, lots of stuff, eventually moved it into filing cabinets, now just stored digital, which should make the sifting process easier, but that is not always the case. If it had not been for the digital transformation that happened in the late 60’s and 70’s, and still taking place today, as the overarching benefit of digital transformation, just sifting through stuff would not even be an option. The sifting of data is a minor part of digital transformation and has been available since the 1970’s – technology which enables it to happen is the greater miracle. I have no academic insight into what you describe Floortje, just practical experience. I absolutely agree that a side effect of the transformation process was replacing old equipment with a modern, smaller digital version, however that was only one very small benefit and as a benefit was way down the list of benefits. In fact, in the early days digital equipment was almost no smaller than analogue equipment, just had huge benefits. The photo shows a mechanical Strowger switch – and brings back many happy memories. It was not possible to self-dial nationally or Internationally, so calls had to be booked via an operator. Calling Internationally apart from being extremely expensive, was like speaking to another planet. Transmitting data was not even a possibility. Although the transistor had been in first production in 1960, during my 7 years with the GPO, I saw tremendous digital transformation, which offered incredible benefits. – Cables, went from paper/lead to polythene covered, making voice quality, transmission capabilities so much better. – The mechanical switches went to Crossbar – the first installed in the UK in 9th October 1968, still used relays but did not use a mechanical path for voice, however limited to 2,000 subscribers per telephone exchange. It was developed 100% privately funded by Plessey, then the GPO decided to adopt it. However, transitioning from Strowger took 20 years, so the old mechanical switches were having to be used by BT customers for a long time. dgets/november-18-1963-push-button-telephones-introduced-11364015949159. This in conjunction with fully electronic exchanges (did not happen until I left GPO/BT), enabled folk to self-dial, nationally and eventually internationally. The advent of the first modem…….the first BT modem was 1,200 bps, was 2 feet cubed and weighed about 30 lbs. I had the job of installing them and maintaining them in the Coventry area in the UK. Eventually BT released a 2,400-bps version, however stated they could not guarantee data speeds of 2,400 bps only 1,200 bps. Then ………………….in 1977, instead of installing these big BT 1,200 bps modems, I was being asked to go to customers and take them out. Every time I met a Racal Milgo engineer, who after I took the BT modem off line, installed a Racal Milgo 9601 modem………………9,000 bps and cost $10,000 each, they also weighed about 30 lbs, had 32 printed circuit boards in them running on BT leased lines that BT only guaranteed for 1,200 bps!! The Racal Milgo engineer would install about 10 per customer at a time – standards did not exist in those days, so Racal had to install their equipment at both ends….the V29 standard came later. He would always take me to lunch in his super Racal provide car – they paid for all his meals and all his petrol!! Eventually, this guy convinced me to join Racal and on my first day, Racal provided me with a super new estate car, all expenses paid and I worked really hard. So now 100% of my time was spent visiting Computer centers – huge IBM mainframes. What were they doing at those Computer centers – sifting data, using magnetic tapes and punch cards. – CPU bandwidth 1.3 Mbps !!!! – Memory – 8-64 Kb !!!!! – Each of those huge removable disk drives stored ……………….. 10 million alphanumeric characters (60,000,000 bits) on 25 disks. 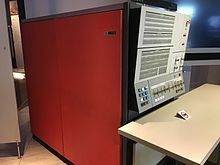 Model 2 has a storage capacity of 20 million alphanumeric characters (120,000,000 bits) on 50 disks. In both models the disks were stacked vertically on a shaft rotating at 1200 rpm. The cost of each disk drive main unit in the 1970’s, $335,000 each !! !, weighed over 1 ton. – Nine-track tapes commonly had densities of 800, 1600, and 6250 cpi, giving 22.5MB, 45MB and 175MB respectively on a standard 2,400 feet (730 m) tape !! Production of those tapes did not end until 2002 !!!! All they were doing Floortje was just sifting data!! Whilst digital transformation was taking place. I left Racal Milgo in 1983 (it was perhaps the best company I have ever worked for), when modems were becoming cheaper and smaller and businesses wanted modems on dial up, until then data modems worked only on leased dedicated private lines. What did these companies want to do, interlink their remote office so they could ……..sift data. I went to work at Tech Nel data. There we sold 300 bps, 1200 bps and 2400 bps dial up modems, ranging from $800 – $2,400 each – we sold a ton because lots of companies needed to sift data in the 1980’s, using dial up phone lines, not private leased lines. Whilst at Tech Nel I managed my customers by sifting through data, it was stored on a small cassette tape (like those used in dictating machines). I plugged into a small keyboard that allowed a data search function, then I had to sit and wait for the tape to whiz back and forth. I traveled within the UK and Internationally a lot and to keep in contact with my staff, I had a two-way radio fitted to my company car – installed by Securicor UK. A handset on the console by the driver, and a huge whip aerial mounted on the back side of the car. It was awesome, although only half duplex, the Securicor control center could patch phone calls through, or relay messages. The radio waves from the UK just reached the shores of Holland and France, so whilst waiting for the ferries to come back to the UK, I would press the call button and a Securicor control center in the UK would answer, I would ask them to pass on a message. The first time I did that I just told Securicor to message my wife, that I was boarding the ferry at Calais. The Securicor guy went orbital, telling me it was illegal to use the service outside of the UK. I told him OK, but please pass the message on, which he did. The system had a portable beeper, which I wore all the time. Securicor would call the car radio, if I did not answer, the car radio would call the beeper. It was an absolutely brilliant service. Then one day………Securicor gave notice that in one month they were closing the service down, because the frequencies would be used for the first mobile phone service in the UK- another great step forward in digital transformation. The Chairman of Tech Nel bought me one of the first phones – not portable at all, awful battery life, and for the first few years, no way as good and reliable as the two-way radio service had been. The advent of the mobile phone marked significant progress in Digital Transformation. Then Coherent headhunted me away from Tech- Nel, just as the Berlin wall etc. was falling…………………………………..Eastern Germany had stagnated since the end of the war, no telecom infrastructure existed, suddenly a lot of data needed to be sifted, the only way to quickly establish a voice/data network in Eastern Germany was via Satellite, Coherent had a new product that sat on their shelf – just what Deutsche Telekom wanted. I devoted 24 hrs. a day, 365 days a year, selling that product – even though I had the title Managing Director EMEA. Today a fast office or home computer processor runs 5 Ghz max, an optical based computer will run 100 Thz !!!!!!!!!!!!!!!!!!!!! I have been working on technology that enabled businesses to sift data since I was 16. Yes over the years, they have been able to sift more data faster, and when the 100 Thz optical transistor processor appears – even faster . The ability to have a terabit hard drive in our laptops is relative new, our laptops now store a lot of data that often needs to be sifted. I am very grateful that David Powell shared his life story with me. It made me realize, that product and service innovation go together, yet perhaps not simultaneously. It takes service firms and the market often a long time to realize what can be done with a new invention or breakthrough technology. Keeping your eyes open for what is happening in the world of computers and trying to get a sense of what new trends are about, is the beginning of any innovation journey. Curiosity and imagination are the key drivers, as the Harvard Business Review recently wrote. If you are wondering what the picture at the top is about. 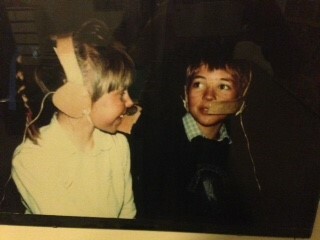 It is me and my brother playing the imaginary “Help Union” help desk. Must have been somewhere around 1977. The same time the technologies David is talking about, were evolving. 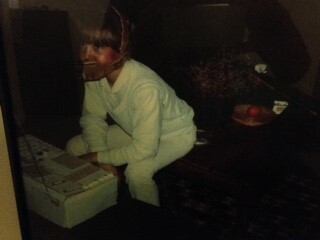 I doubt my brother and I had never seen a real computer, let alone that we had any idea what a help desk was or did. Our task was to save any creature in any difficult situation by getting them the help they needed. Creating a “computer” from cardboard boxes was the most fun part of the game! Coming up with the stories was secondary. David’s comments made me realize, how big the gap is between inventing new technologies, being just curious, and transforming novel opportunities into valuable services. Creating an imaginary solution from cardboard is so much easier!